These eyeglass cases are soft, lightweight, durable, and stylish at the same time. Avoid scratched, shattered, or broken lenses, as well as bent or broken frames, marks, or dents! These cases provide convenient storage for all forms of frames - traditional everyday frames, myopia glasses, children's eyewear, reading glasses, sunglasses, and more! These luxurious eyeglass cases are appropriate for professional settings and fancy occasions alike. They also make a great gift for holidays, birthdays, anniversaries, and more! 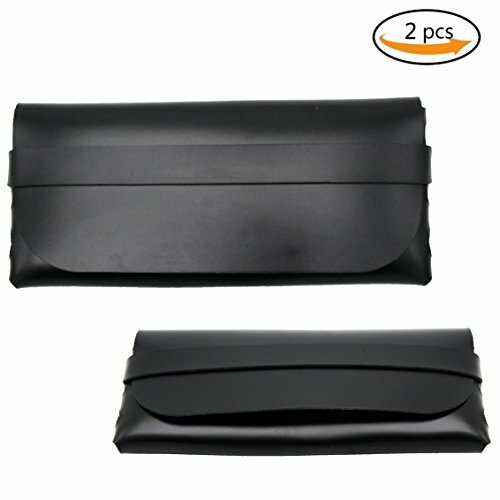 Material : PU Leather, each Pouch comes with a high quality microfiber cleaning cloth inside. Extremely easy and hassle-free to open and close the case. It also ensures that even if the spectacle case inadvertently drops from your hand the flap remains closed and you do not run a risk of damaging the glasses. Moreover, the neutral tone makes the case equally appropriate as Eyeglass cases for Women and Men. These glasses case are extremely useful for people who like to travel light and do not prefer carrying products that occupy large space in their bags. Unlike any other hard glasses case, our eyewear case conveniently folds flat and occupies minimal space when the glasses are in use and not in the case. This is an ideal characteristic when you do not have much space in your home and also when you prefer your space to be tidy and sort of empty!